However, i took a $2.00 bus ride up to the Cobblers Cove Resort to eat at for lunch (also was recommended to look for sea glass in front of the hotel in the Caribbean waters). I actually got off prior to the hotel and went to relax at the beach at Mullins Bay (you pay for a chair here). Well I never had the chance to sit, as I was walking back and forth collecting glass on the beach and where the waves broke. However, they didn't tumble smooth for some reason and if they did, it lost the decorative pattern, so after Mullins I walked up about 10 minute walk to Cobblers Cove Hotel to eat. There is a public path that can take you right out to the beach and in front of the hotel, here is where I found old rum bottle glass, etc. Jewelry quality grade on some pieces, took home 5 lbs of glass, I liked finding the old pre 1900's pieces of rum bottles, they will look like rocks, hold them to light and see color. Local I met, said on a rare occasion you can find a red. Walk the length of the beach, it's a hit and miss too, as people collect there and the locals sell it. Found on Miami Beach (Enterprise Beach), Barbados. large piece of white. Dominica, not sure of name of the beach, lots of sea glass. 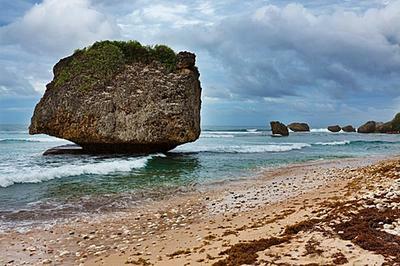 If you're on a cruise ship, I am not sure if you will have time to check out the beaches in Barbados. I also was only there once so not an expert. When I stayed at Divi Southwinds Beach Resort, I took a bus to the other part of the island with the locals and it was a long ride back. You may be able to get a cab, not sure how much it will cost. Mullins Bay was a pretty flat beach, slight angle. There is a restaurant there I saw on the road. I found glass there, but again it's hit and miss. I remember a few stairs, do not recall a ramp, not sure of the type of handicap you have. Research the islands and spots before you go, Google info on the area. We're heading on an eastern Caribbean cruise, including Barbados, St. Kitts, Dominca, St. Martin and St. Thomas. We have previously been to St. Martin and St. Thomas, but not to the other islands. Could you please tell me if there's a beach that has sea glass that is easily to get to for a handicapped person?